Address Sign with State Outline - - custom made 11.5" x 11.5" square sign personalized with your address superimposed over an outline of your state's shape. All 50 US states available. Made in USA. Wall mount 11.5" x 11.5" square address sign. Engraved personalization. Characters and state shape are permanently engraved into the sign during the production process. Holds two lines of personalization for your address. Line 1 holds five (5) 3.5" characters or four (4) 4" characters. Line 2 holds eight (8) 2" characters. Please type the full state name (not its abbreviation) into the State name input box. Eight vivid color combinations: sky blue with white; black with white; white with black; brushed gold with black; brushed stainless with black; kelley green with white characters; red with white characters; and yellow with black characters. Comes with four 3/16" diameter fastener holes and stainless mounting screws. 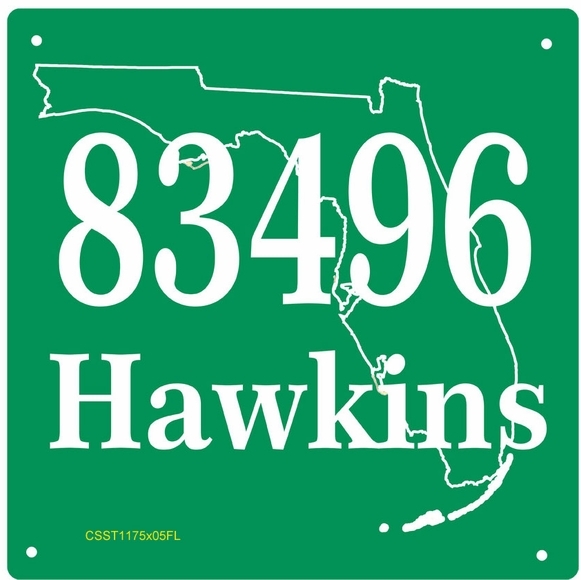 Personalized address sign features an outline of your state's shape. Crafted in the USA by skilled artisans to assure the highest quality.